Overview Respiratory distress syndrome (RDS) also known as hyaline membrane disease is a pulmonary disease resulting from immature lung development and surfactant deficiency. Most frequently seen in preterm infants, the clinical presentation is characterized by signs of respiratory distress including nasal flaring, tachypnea, and grunting (an expiratory sound that is heard as the infant exhales against a partially closed glottis). 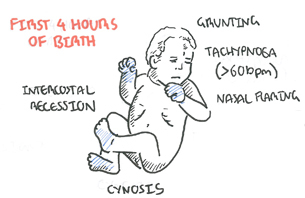 Symptoms often present shortly after birth and can increase in severity over the first 48 to 72 hours of life. The radiologic findings of RDS consist of a homogenous ground glass appearance of the lung fields with visible air bronchograms. Hyperpnea: refers to deep, relatively unlabored respirations at mildly increased rates. 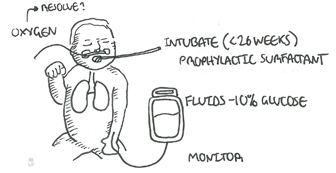 It is typical of situations in which there is reduced pulmonary blood flow (e.g., pulmonary atresia), and it results from the ventilation of underperfused alveoli. Tachypnea: refers to shallow, rapid, and somewhat labored respirations, and it is seen in the setting of low lung compliance (e.g., primary lung disease, pulmonary edema). With normal chest recoil, the infant’s lungs fill with air. Think Infants born by caesarean section are more likely to have retained lung fluid. The main function of surfactant is to decrease surface tension of the alveoli allowing for maintenance of functional residual capacity preventing atelectasis and lung injury. The surfactant proteins also contribute to natural immunologic defences and assist with the spreading of surfactant throughout the alveoli and the recycling of surfactant between cells and the airspaces. Persistent pulmonary hypertension of the newborn is a clinical syndrome of severe hypoxemia resulting from failure of the foetal circulatory pattern to transition normally to the newborn circulatory pattern. 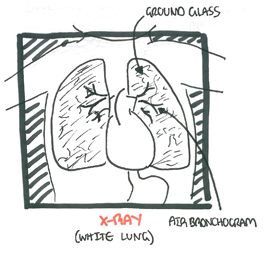 A chest x-ray is the investigation to perform in infants with respiratory distress. Findings for RDS are white lungs with the presence of air bronchograms and a ground glass appearence. Air bronchograms are so called because the small air-filled bronchi are seen outlined against the opacified fluid-filled alveoli. Ground glass is because of alveoli collapse. 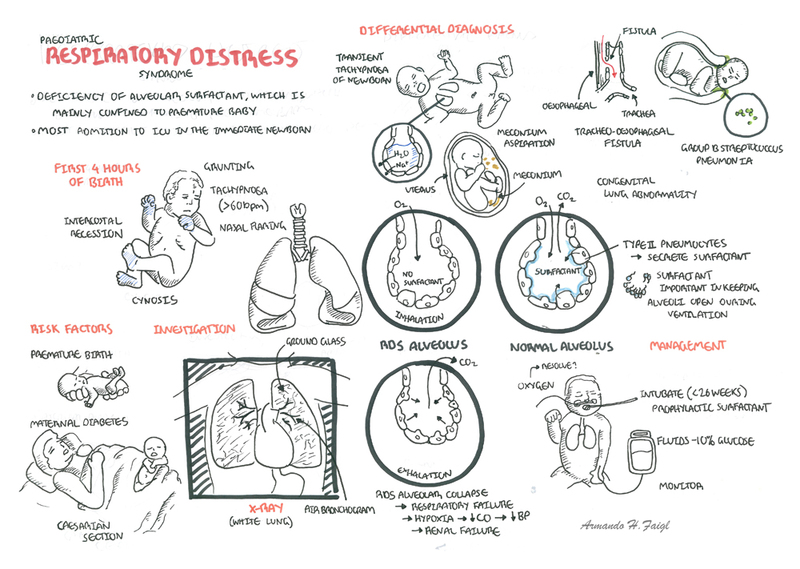 The primary cause of RDS is deficiency of pulmonary surfactant, which is developmentally regulated. Fetal alveolar development is occurring in utero. Week 20 of gestation, surfactant is slowly expressed. 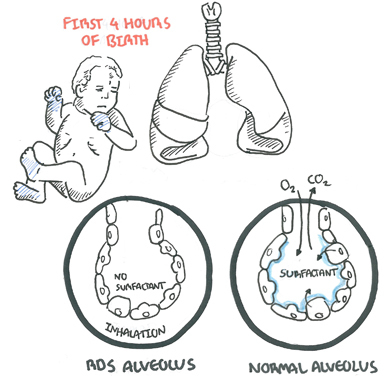 Inability of the infant to maintain air in the lung at the end of expiration resulting in a tiny area of collapsed lung (microatelectasis). Side Note Surfactant is a surface-active lipoprotein complex comprised of a mixture of phospholipids (90%), proteins (10%), and a small portion of other neutral lipids. The main function of surfactant is to decrease surface tension of the alveoli allowing for maintenance of functional residual capacity preventing atelectasis and lung injury. The surfactant proteins also contribute to natural immunologic defences and assist with the spreading of surfactant throughout the alveoli and the recycling of surfactant between cells and the airspaces. Remember Surfactant administration should be considered in any premature intubated infant with a presumed diagnosis of RDS. Dependent on general appearance at birth and severity of underlying lung disease. Long-term risks of chronic lung disease. Classically worsens for 2-3days, then diuresis occurs recovery over 3-4days. Subsequent improvement is coincident with increased production of endogenous surfactant with resolution of symptoms by one week of age.